Though Grand Gulf was initially larger and wealthier than Port Gibson, it suffered a series of disasters in the 19th century, including a large steamboat explosion which decimated its docking facilities, a series of tornadoes, brutal waves of Yellow Fever, and destruction from the Civil War. All of these disasters were compounded by the eastward movement of the Mississippi River, which knocked out much of Grand Gulf’s infrastructure. These repeated tragedies effectively diminished the importance of Grand Gulf, leading to the rise of Port Gibson as the most prominent town in the county. The earliest record of Jewish life in Port Gibson is the arrival of the German Dishinger family in 1839. E. Dishinger and his wife Roseanna settled in Port Gibson and began to make and sell shoes. The Dishingers were closely followed by the Keifers, Biers, Rosenbergs, Ungers, and Bernheimers, most of whom made their living by opening up blacksmith, saddle, and general merchandising stores. The new Jews of Port Gibson enjoyed rapid success, and filled the much needed role of a merchant class in a largely agricultural society. About 20 years after the arrival of Jews in Port Gibson, the Civil War began. The Jews of Port Gibson were quick to prove their Southern status by joining the Confederate effort. At least 13 Port Gibson Jews joined the Confederate Army, though only three Jewish families owned slaves. They most likely joined the effort due to their commercial position in the town. The Southern economy was so dependent upon the plantation system, business owners had a stake in the Civil War as well. In the aftermath of the war, however, Jews gained both affluence and acceptance as they worked with their fellow Port Gibsonians to rebuild the local economy. Port Gibson was lucky compared to neighboring towns: it was not burned by General Grant’s troops. A Port Gibson legend claims that General Grant deemed the town, “too beautiful to burn,” and as a result the Port Gibson infrastructure remained intact despite the war. After the war, Port Gibson’s slave-based economy was replaced by a share-cropping system. The Jewish community facilitated this new system as merchants who offered credit to local farmers. ​Perhaps the wealthiest and most prominent Jewish family in Port Gibson history was the Bernheimers. Samuel Bernheimer was born in Hohenems, Austria on September 12, 1812, and immigrated to the United States via New York City. Samuel Bernheimer slowly made his way south, with stops in Charleston, South Carolina, and Liberty, Mississippi, before arriving in Port Gibson. 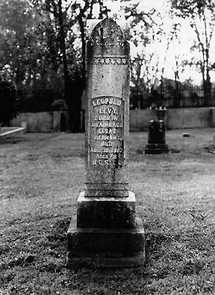 He married Henrietta Cahn and arrived in Port Gibson by 1847. Bernheimer teamed up with his brothers and brother-in-law, William Cahn, to form a mercantile business called S. Bernheimer and Brothers. This company, which sold both general merchandise and specialty items from Austria, England, Italy, and Switzerland, found quick success and made Bernheimer one of the wealthiest men in Port Gibson. During the Civil War, Samuel Bernheimer supported the Confederacy, but when General Grant took over Port Gibson, he occupied the Bernheimer home as his headquarters. S. Bernheimer and Brothers suffered financially during the war, but due to the tremendous efforts of Marcus Bernheimer, Samuel’s son, the company stayed afloat. After years of diligent work stabilizing the Company, S. Bernheimer and Brothers was handed down to Marcus Bernheimer’s sons, giving the store three generations of successful Bernheimer leadership. Though none of the Bernheimer clan remains in Port Gibson today, their house still stands as a bed and breakfast as well as a tribute to the region’s Jewish past. 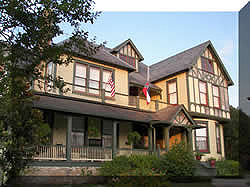 It is not the same house that was occupied by General Grant and his troops, as the original home was destroyed by a fire in 1900. The current structure was built in 1901. The home stayed in the Bernheimer family until 1929, when it was bought by a fellow Jew, Samuel Weil. The house remained under Weil ownership until 1996, when it finally passed into non-Jewish possession. Today, the house holds many of the marriage certificates, business records, and other relics that commemorate Jewish life in the region. In 1859, 22 Jews gathered to sign the charter for their congregation, Gemiluth Chassed (“Acts of Loving Kindness”). The congregation created both a cemetery and a school in 1871, and in 1874 joined the Union of American Hebrew Congregations. Also in 1874, the congregation formed chapters of both B'nai Brith and the Free Sons of Israel. Gemiluth Chassed did not have a permanent building until 1892. The congregation had a series of rabbis until 1908, and then continued under lay leadership. As the Port Gibson economy changed, the wealth and prominence of these early Jews began to decline. Between 1900 and 1910, there was a major shift in the population. Though the Jewish arrivals and departures were pretty even in number, those who left were often young and single whereas those who came tended to be older and widowed. As the youth of the congregation left to find greater financial opportunities, many older Jews came to Port Gibson to retire and be near their families. This trend caused the average age of the community to increase rapidly. Between 1910 and 1920, this demographic shift took a toll on the Port Gibson population and the Jewish population was reduced by about 30%. As the boll weevil rapidly destroyed the Port Gibson cotton economy, many Port Gibsonians moved to larger urban centers to pursue non-agricultural careers. As a result, many of the Jewish store owners faced a rapidly diminishing market for their goods, and headed to cities in search of greater economic opportunities. The emigration from Port Gibson was exacerbated by the fact that as young Jewish men left, the marriage market for young Jewish women shrunk. Young Jews of both sexes were forced to find marriage partners outside of Port Gibson, further reducing the overall Jewish population. In 1905, an estimated 171 Jews lived in Port Gibson; by 1937, only 44 Jews remained. For much of the remainder of the 20th century, a few Jewish merchants continued to own stores in Port Gibson, though their numbers continued to dwindle. One of the last Jews of Port Gibson was Karl Weil, whose family had immigrated to the United States from Germany in 1864. In his description of his childhood in Port Gibson, he recalls going to a Presbyterian school, which respected his religion so much that they even offered a class on the Old Testament just for him. He attended Sunday school from ages seven to ten, but never received a bar mitzvah because there was no rabbi at the time. A major event from his childhood occurred when Hitler came to power in Germany, and Weil’s father responded by bringing all of his German nieces and nephews to the United States. While they adjusted to life in the United States, Weil’s cousins all lived with him in the historic house formerly owned by the Bernheimers. Though the cousins have all since passed away, they lived long, prosperous lives due to his father’s courageous efforts. Today there is no Jewish community in Port Gibson, but the synagogue remains as a reminder of Jewish contributions to the town's history.